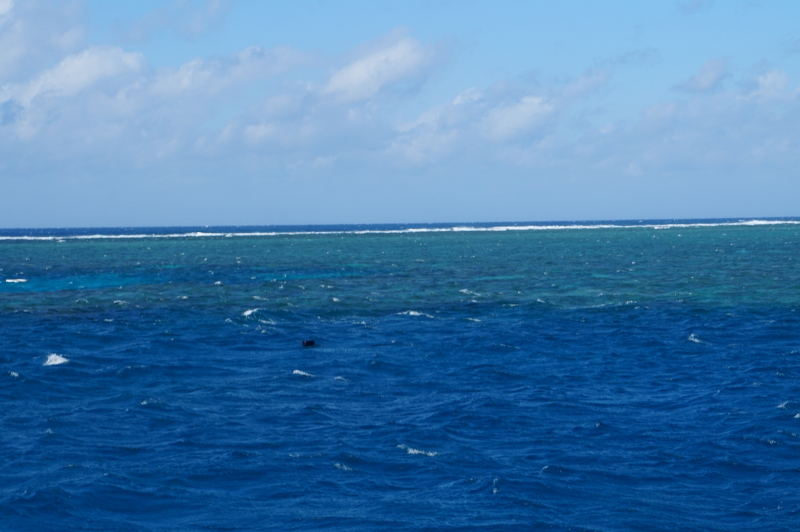 Reef Teach and the Great Barrier Reef | Hello Cool World! When I say Australia, what’s the first thing that comes to mind? Okay, kangaroos. But how about the second? Oh, all right, the Outback. But after that? Vegemite? Really? Never mind. My point is that the Great Barrier Reef figures prominently in everyone’s idea of Australia. So of course, we had to go see it ourselves! The first step, however, is to understand the reef. To do this we went to Reef Teach in Cairns. We had heard about it from some friends, and it had great reviews, so why not? Reef Teach is a nonprofit organization that describes itself as “tourism information”, and that’s exactly what it is. 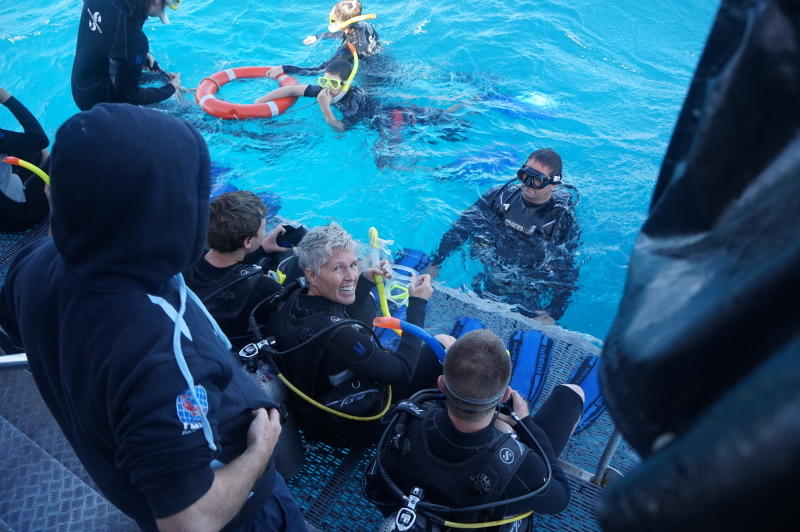 Our host, Gareth, went through the (extensive) basics of what we might encounter underwater, but the best part was that he did it in a highly comedic way. As he taught us about everything from corals to sea cucumbers, he was constantly cracking jokes, and pretty good ones at that! All jokes aside, the point of this program was to teach us (the tourists) something and, like or not, it actually did. The first thing he asked the group is why it is called the “Great” Barrier Reef, to which I responded it was probably an ego trip. Unfortunately, this was completely wrong. As we learned, the Great Barrier Reef is comprised of 3,500 smaller reefs that extend a distance of 2,500 km, thus earning its name. As he explained further, we learned more about the types of coral that make up this natural wonder. One of the most prominent types is staghorn, so called because it looks like a stag’s antlers. It grows very fast, 20-30 cm per year, but also dies quickly, thus making fertile ground for new coral. Another type to look out for is the brain coral (it looks like a brain). It grows extremely slowly (5mm a year), but can get absolutely HUGE! With the building blocks in place, it is necessary to know more about how they function. Corals are made up of polyps; tiny, stationary animals, with a hard calcium outer skeleton. They require sunlight to live, and so must be quite close to the surface. They are quite fragile, so DON’T STEP ON THEM. To my delight, I learned that they reproduce in the most unusual manner of throwing the necessary ingredients to one another (apparently this is quite a spectacle when it happens). Finally, we learned about the creatures that inhabit the coral. The fish, first of all, are quite numerous. Though accounts vary, there are an estimated 1,500 to 2,000 fish species that exist within the reef. Many of these can be sorted by shape. For instance, torpedo, oval, and disc shaped fish are all quite common here. Within this there are, of course, the different classes of fish, and within THAT are the individual species. While some of the things he taught us I already knew, there were some that stuck out as being extremely odd. For instance, there is a type of wrasse (which is torpedo shaped) called the cleaner wrasse that will eat the grime off of other fish. Furthermore, they have areas designated as “cleaning stations”, where it is “illegal” to eat another fish. 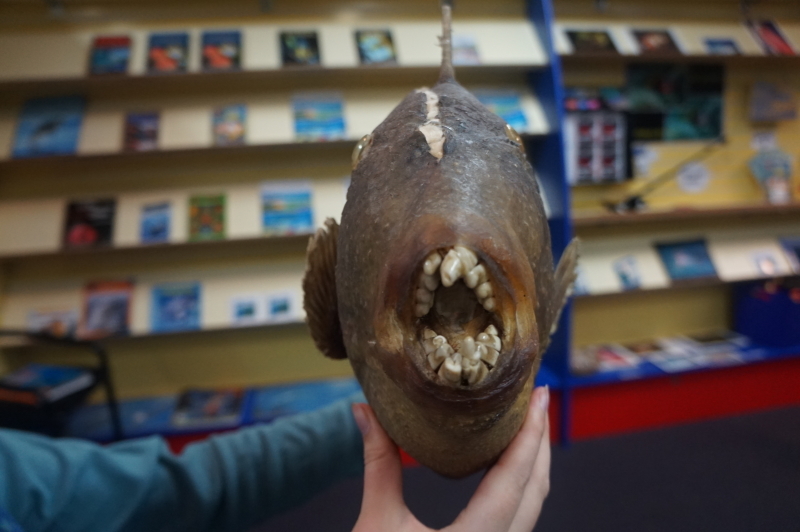 There are also imposter fish (not their actual name) that will try to imitate the cleaner wrasse, and will take a bite out of the gill instead. My favorite animal, however, was a type of asexual crab that, in order to determine who would have to go through the trouble of carrying their offspring, would have a sword fight with their manly bits! The first contestant to stab their opponent wins. 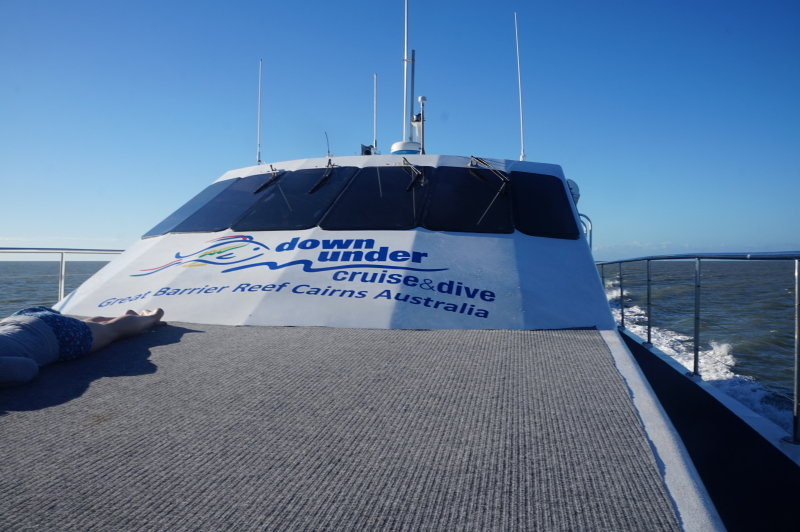 All in all, I enjoyed this experience quite a bit, and recommend that anyone wanting to learn more about the reef, and who will be visiting Cairns, should attend a class as well! Several days later, we got a chance to go to the reef itself. Unfortunately, the day turned out to be quite wavy, and many people were throwing up on the way out in the boat. This was made worse by the fact that the reef is quite far offshore. Luckily, I discovered that if you go on the top deck the nausea subsides, otherwise I most definitely would have been throwing up with the best of them. We had the option of doing a “try dive”, and my mom and I jumped at the chance. (Although my mom has done some scuba diving, it was a long time ago and so her certification wasn’t up to date). As such, it was in a small room at the top of the boat that I learned the basics of diving: how to clear my mask; how to keep my lungs from exploding; what buttons to press; and what buttons to most definitely NOT press. Luckily, it ended up being pretty easy to memorize, and before I knew it we were in the water! 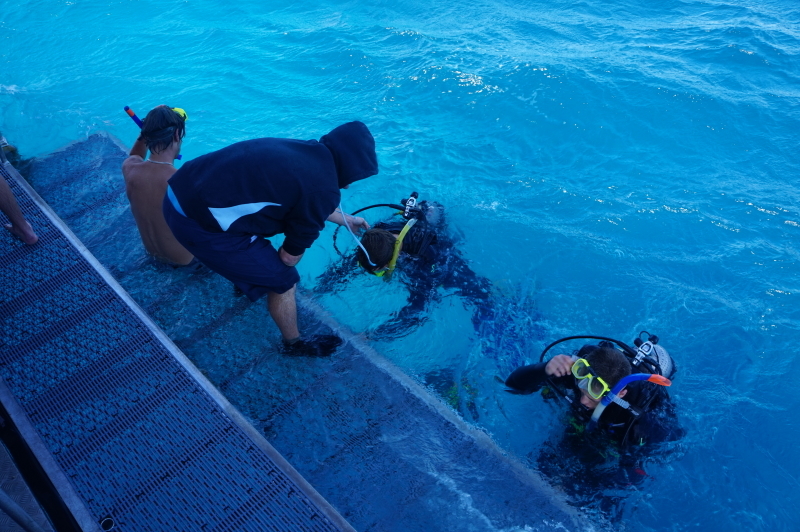 Since my mom and I were not certified, we had to link hands with our instructor in order to dive. I was in the middle, and between the instructor insisting we go one way and my mother wandering off in another, I felt like a marionette being controlled by a fairly tipsy puppeteer. However, this could in no way diminish my amazement as I marveled at what could only be described as another world. No matter how much Reef Teach had taught me, it could never have prepared me for the amazement of the actual thing. When we snorkeled on the island of Koh Chang in Thailand, it had many more fish. By contrast, the ones here were larger, and much more interesting. As a result, I never felt like I was going to accidentally kick a fish, but I got a much greater kick out of the ones I saw. Since I could dive now, I could also get much closer to the fish that looked the most interesting. As we swam between huge crevasses I felt somewhat like I was flying. Just, you know, underwater. Although amazing, our dive was pretty short, so it was only once I surfaced and returned to the reef for snorkeling I got a good look at the reef. While snorkeling, I was amazed at how varied the scenery was. What I mean is that it was never flat or predictable, always twisting, turning, and full of peaks and crevasses. It was in this ever changing landscape that I saw it. The SHARK. While at first shocked and scared, I very quickly became interested, and a little cocky. HECK! I was (almost) bigger than he was. In fact he seemed quite content to cruise along and pay me absolutely no attention. I figured it was either a white-tipped, or silver-tipped, reef shark, which are pretty harmless. One moray eel and a couple fish later I found myself aboard the boat having a lunch of steak and salads. My head was still racing from my experiences. As my family and I began to share what we had seen over our steaming lunch, the boat started up to take us to our second destination. 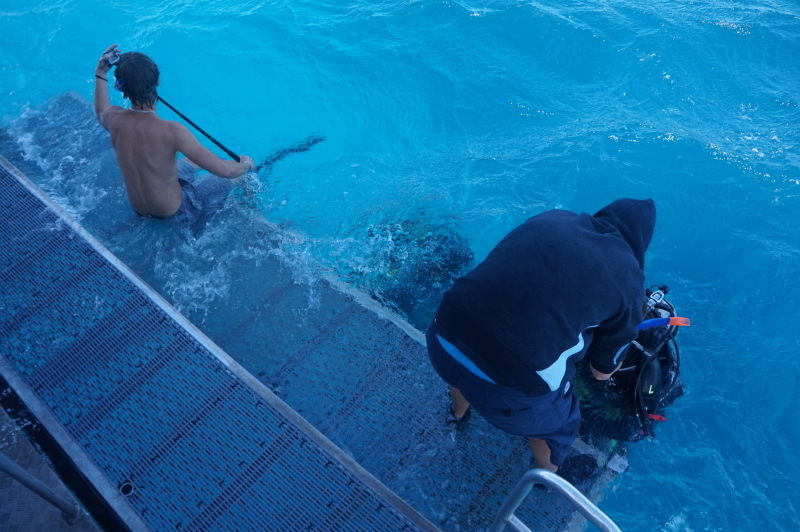 Unlike the first reef, the second was quite close to the surface so whenever the waves passed, I found myself smacked against the coral, which hurt me quite a bit and probably wasn’t good for the coral. As such, I didn’t enjoy it as much as the first. All the same, this did mean that I got a better chance to examine the coral itself, and even recognized some of the types shown at Reef Teach. There were also multitudes of fish once more, although none of them particularly stood out. All in all, the first reef trumped the second multiple times over, but that didn’t stop me from enjoying it all the same. The reef from above. Wish we had a waterproof Go Pro! When scuba diving, how exactly does one keep one’s lungs from exploding? #1 just keep breathing. Also don’t go up and down too quickly so you lungs have time to adjust. 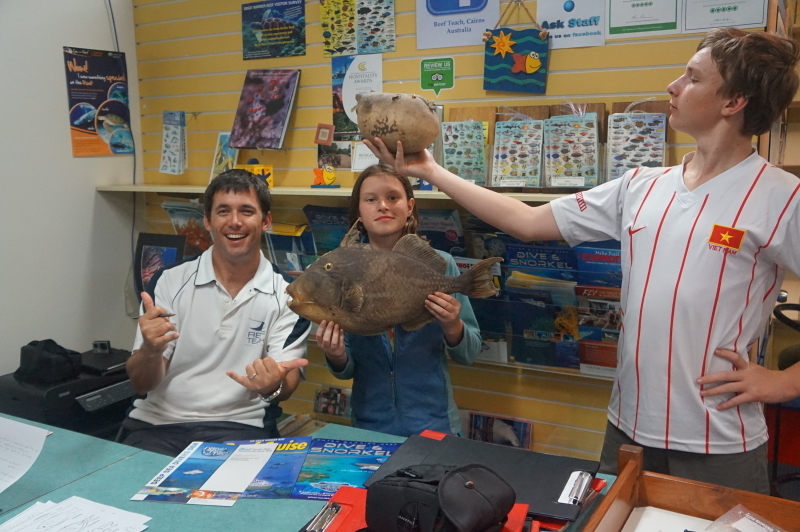 The Reef Teach instructor’s humour must have rubbed off on you because that was hilarious! A very enjoyable read, Aran!